In Beech Class our Teacher is Mrs Bieda and our fantastic Teaching Assistant is Mrs Phillips. We are looking forward to the year ahead with lots of exciting topics to explore. In Beech Class we think of others and always try our best when facing challenges. This is so we can all enjoy learning in a caring and positive environment. PE lessons will be twice a week with Mr Briant; we would kindly ask that children have their P.E. kits in school every day in case there are any changes to the regular lesson times. As part of this term’s Healthy Body, Healthy Mind topic, Beech class have been carrying out a scientific investigation into the effects of drinks on our teeth. They used five identical eggs and placed each one into a clear container (eggshells are very similar to the surface of our teeth). The children then measured equal amounts of water, milk, orange juice and Coca-Cola and poured it into the containers. The last egg didn’t have any liquid added and was the control egg with no changes made to it. The children have been observing the eggs every morning and have noted the changes. The photographs show the eggs after less than 24 hours in the liquids and after six days in the liquids. Beech Class are disgusted at the appearance of the eggs that are in the Coca-Cola and the orange juice, we have discussed the importance of cleaning our teeth twice a day to prevent our teeth looking like the eggs! During Health Week, Beech class enjoyed their second session with Sumi, a home economist from the Royal Academy of Culinary Arts. The children were given all the ingredients they would need to make a healthy salad, then Sumi demonstrated how to prepare each ingredient by using one of two chopping techniques; the bridge hold and the claw grip. All the children were able to successfully use their newly acquired skills to prepare their ingredients, before adding whole wheat pasta, quorn and sweetcorn to complete their salad. The children in Beech Class are celebrating their artwork becoming famous in America after Eric Joyner, a contemporary San Francisco artist whose work features robots and doughnuts, shared photographs of their work on his Facebook page. The post received well over 300 likes and numerous positive comments from his fans. Search Eric Joyner on Facebook to see for yourself! Beech Class wrote questions for Eric to answer as they were writing a biography on him, and Mrs Bieda e-mailed them to the artist. The children were delighted when he replied, so decided to send him photographs of examples of their work from the term. Eric once again replied, remarking how proud he was of the children’s work. Every child made their own robot head, then was individually photographed with giant doughnuts to create their own Joyner style painting. They then painted a watercolour of their photograph. The children gain so much from experiences like this, it made writing biographies more meaningful because they were able to include information they had personally researched, and they thoroughly enjoyed the topic. 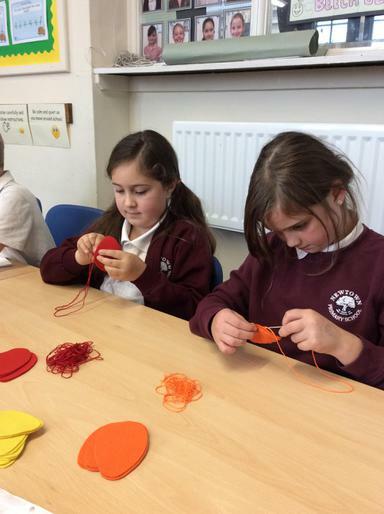 Over the last few weeks, the children in Beech Class have been busy practicing their sewing skills. 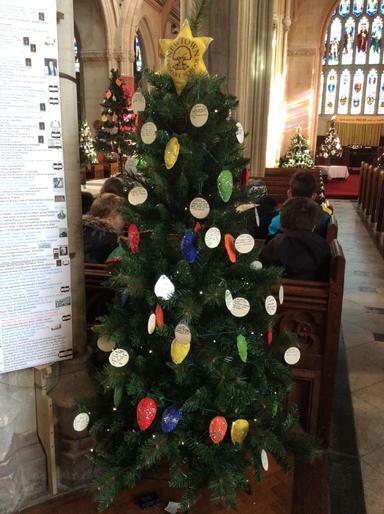 Every child sewed a Christmas tree decoration which decorated our school tree as part of this year’s Christmas tree festival, held in St. James’ church last week. 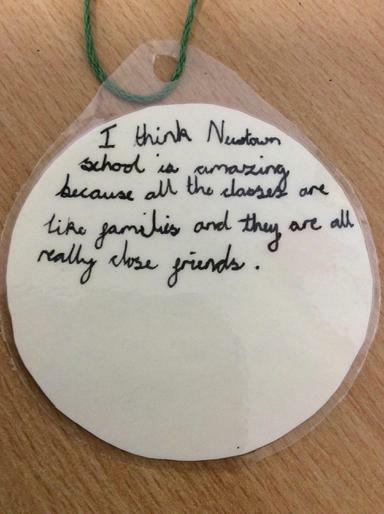 They also made baubles which detailed their thoughts about what they like about Newtown School. 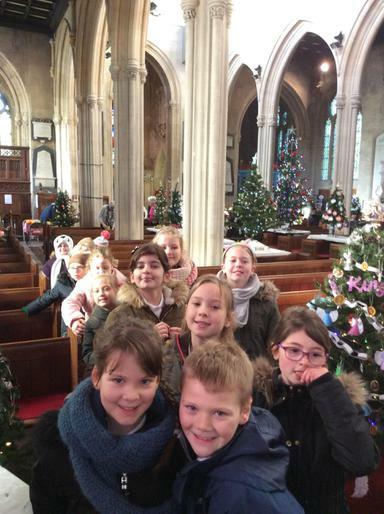 We walked to the church to have a look at all of the trees in the festival and to put the baubles on our tree. The volunteers at the church were very complimentary about the behaviour of the children whilst in the church, we were even given squash and biscuits! Beech Class have been really busy so far this term! In Literacy they have learnt about the four countries of the United Kingdom and have published some amazing leaflets to promote London, Cardiff, Edinburgh and Belfast. In Art, the children looked very carefully at photographs of themselves and used oil pastels to draw fantastic self portraits. They studied the proportions of their faces and were surprised at what they noticed. Ask your child what they can remember!